How’s it going? If you weren’t aware of this, my mom’s very first wedding anniversary was yesterday. Well, maybe not her very first… or second first… so, uh… as of yesterday, my mom has been married for exactly one year. Congratulations, Momma! 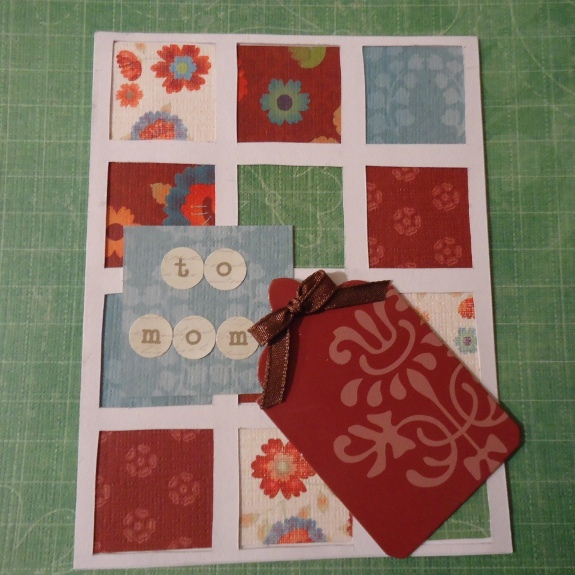 To celebrate I’ve made her this awesomely hand-stitched card; the color palette is courtesy of The Play Date Cafe! Usually I use a french knot to dot my i’s, but this week I decided to use a teeny tiny drop of shiny purple nail polish. The color is ULTA’s Purple Reigns, and since I’m pretty terrible at fingernail polishing, I’m glad I found another way to use it. 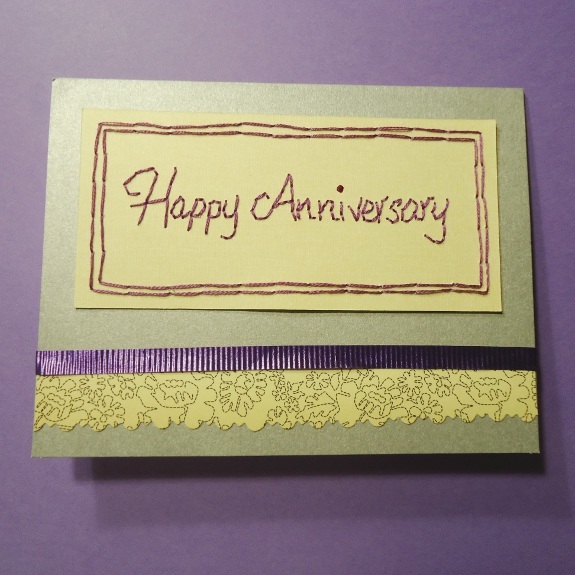 Also, Brad’s mom gave me a gigantic spool of this purple birthday curling ribbon that I’ve been dying to use; I love adding a little texture to my cards. Oh, and tomorrow I’ll be posting my monthly guide to arts and crafts events local to northeastern Pennsylvania, so if you’re from around these parts or will be visiting the area in the month of May, be sure to drop in! If you’re hosting an event in the area(or are simply just aware of one), feel free to shoot me an email and let me know all about it. Thanks for stopping by! Hey there! Before I get down to business, I’d like to say sorry for not blogging this past week. As of last week, I had to go back to work at my full-time job, which kept me pretty busy. Then our Liberty broke down while Brad and I were on our way home from work, and we had to leave it at a random Jeep dealership along the way. Unfortunately, it looks like we’re not going to be seeing our car again for at least another week. In lighter news, here’s my entry for the Mojo Monday sketch challenge! This challenge was a lot of fun to work on! I believe the intention of the sketch was to help the participants to use up some scraps, and while I tried to pull that off, I ended up making my scrap pile bigger in the process. When I finished cutting out all of the individual squares, I didn’t think they were lined up quite right, so I then created somewhat of a frame for them out of white cardstock. I love that all the paper I used for the squares has the same texture to it; I hope you can tell from the picture! This flowery card is intended for my mom for Mother’s Day, but today is actually my mom’s 1st wedding anniversary! Be sure to stop by tomorrow, of course, to see the card I’ve made for my mom and her (relatively) new husband. Anyway, thanks for looking, and be sure to check out this week’s sketch challenge on the Mojo Monday blog! Hi again! 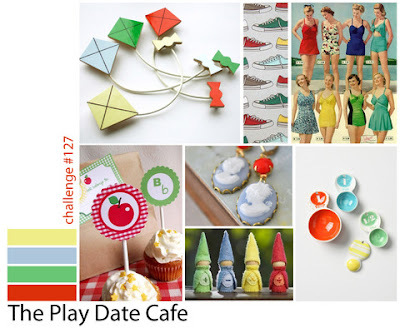 While it may seem that I’m on the ball today for remembering to post twice, really I’m just such a procrastinator that I have to write my entry for the Play Date Cafe at the very last minute. So here’s another awesome hand-embroidered card from me to you, readers. Hey, internet! Today I’d like to introduce my first featured project ever – an awesome, airy, warm weather dress that I’ve been dreaming about and not doing for over a year. The very lucky pattern to be graced by my fingertips is the lovely V8727, a stunning little number and the next step on my journey towards a figure-flattering wardrobe. I’ve also managed to find the prettiest fabric in the valley! I was a little disappointed at its price, and spent hours looking around Joann for something that was cheaper and prettier, but lo and behold, it was on sale after all(and shh! Don’t tell anyone but it’s actually just quilting cotton…) I just couldn’t resist. Way at the bottom here you’ll see the tippy top of my thumb peeking out, let’s say it’s to help you get an idea of the scale of the print. It’s called “A Day in the Garden” and you just might find it at your local Joann Fabrics. If so, please don’t buy it; it’s mine. In other news, you’ll be hearing from me again this Friday, as it will be 4-20 and I have a very special post readied for the stonier crafters out there. Not you, of course. Thanks for reading! Hey, kids. There’s a holiday coming up that all of your friends are talking about, 4/20. Now, I know you may not be interested in a day that’s all about celebrating the ganja, but it just so happens that some of your “other friends” are. Let’s not leave them out of the card-making loop. This here’s a great card for your neighbor’s troubled son, the hippies that grow your organic vegetables, or your poor great auntie with glaucoma in Michigan. I’ve hand-stitched the silver border. The letters and numbers are scrapbooking stickers and punch-out paper, because, quite frankly, it’s all I have. I thought maybe the card should say SMOKIN’ instead of SMOKING, but I didn’t have an apostrophe and I like to be grammatically correct. This card is an entry in two carding challenges! 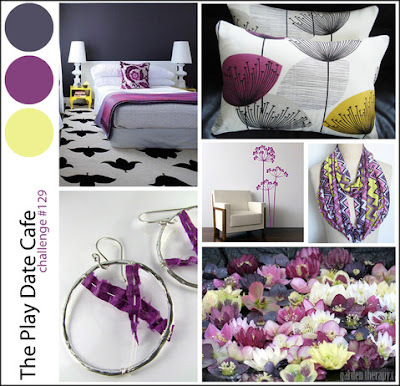 This week’s color palette is inspired by the color story from The Play Date Cafe, while the sketch is from the Mojo Monday blog. The PDC challenge closes tonight, but you can see a new palette each week on Thursday! 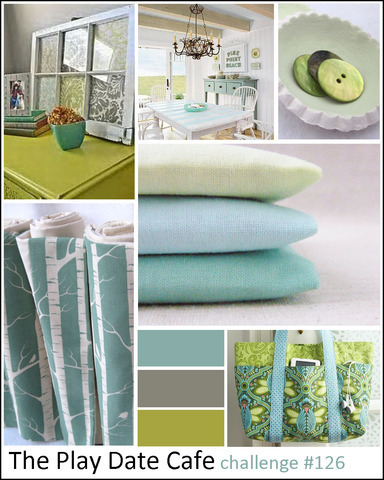 If you like this layout, head on over to Mojo Monday’s challenge – you’ve got a whole week to enter! Thanks for looking, internet! Any advice on making letters that look more professional and elegant? Feel free to leave a comment below! The words “Thank You” are hand-embroidered, while the colors are loosely inspired by this design-seeds palette. You can also find the Mojo sketch for this week below, and as always you can click these images to end up at their respective sources. Thanks for reading, internet!